What is the T on the bottom of a Rolex dial? 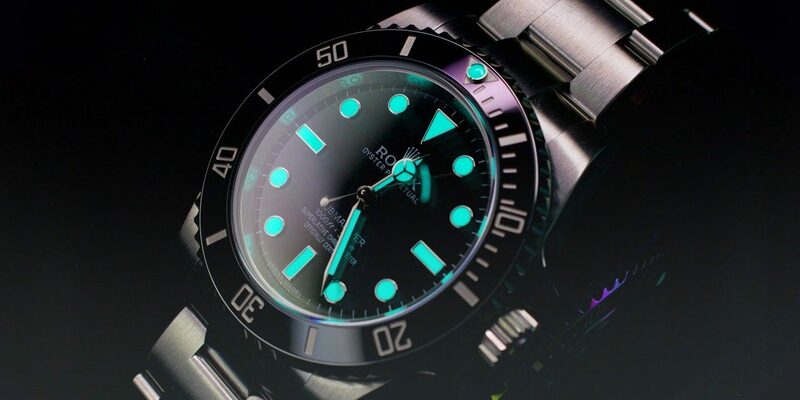 Or, why my Rolex watch glows. SWISS T < 25 = Tritium less than 25 mC. These designations and their location at 6:00 o’clock on the dial are a Swiss watch industry standard and are not exclusive to Rolex. Since the turn of the 20th century when watches were starting to be worn on wrists, and even with their predecessor, the pocket watch, there has always been the necessity to be able to read the watch in darkness. Until the quartz and electronic watch revolution whereby a watch had its own electronic power source to power some type of lighting, reading a watch at night required the watch hands to glow and the only method was via some type of power source -for watch luminescence, it is either electricity, radioactivity, or the sun and/or ambient light. Until the late 1950’s and early 1960’s, Radium was the preferred material in the watch industry for painting onto watch faces and hands because they were extremely bright as compared to other types of materials at that time, required no electricity as there were no battery powered watches at the time. Unfortunately, Radium was radioactive. After the radioactive paint dried and was kept intact inside a watch case, the use of Radium was considered safe. Unfortunately, the application of Radium onto the hands created unsafe conditions for watchmakers, either from the application of Radium or when the paint dried, was damaged, and Radium dust was in the air. After numerous cases of workers contracting cancer, the practice was stopped in the watch industry by the early 1960’s. If you stumble across a SWISS labeled Rolex, the Radium is safe as long as it is held within the watch case. Additionally, if the watch is sent to a Rolex Service Center, Rolex will replace the Radium hands and watch face with the much safer LumiNova or SuperLuminova hands.